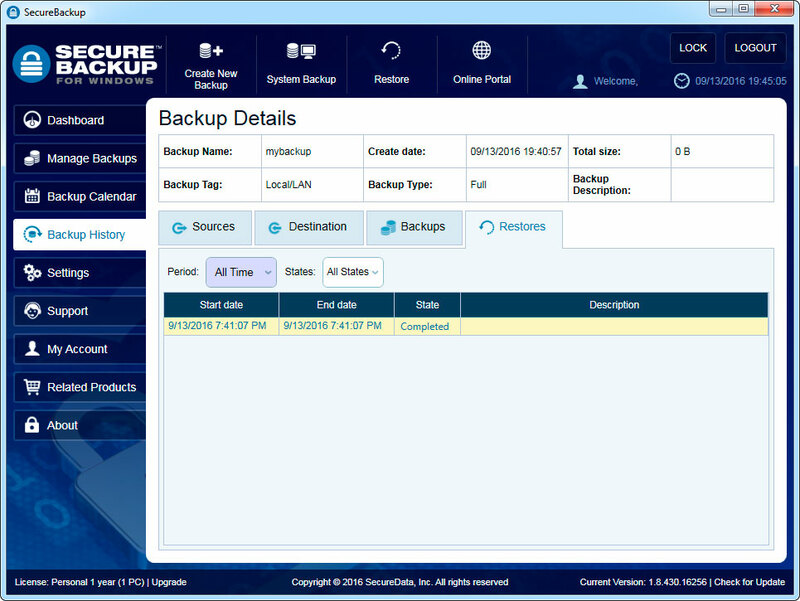 SecureBackup software. These fundamentals will set you up for protecting your data in the best way. 30-day free trial or a paid subscription, consisting of three packages, which you can choose depending on your needs, with an option to upgrade any time. After successful registration you will get purchase receipt, includes your subscription license key that was emailed to the address you provided. 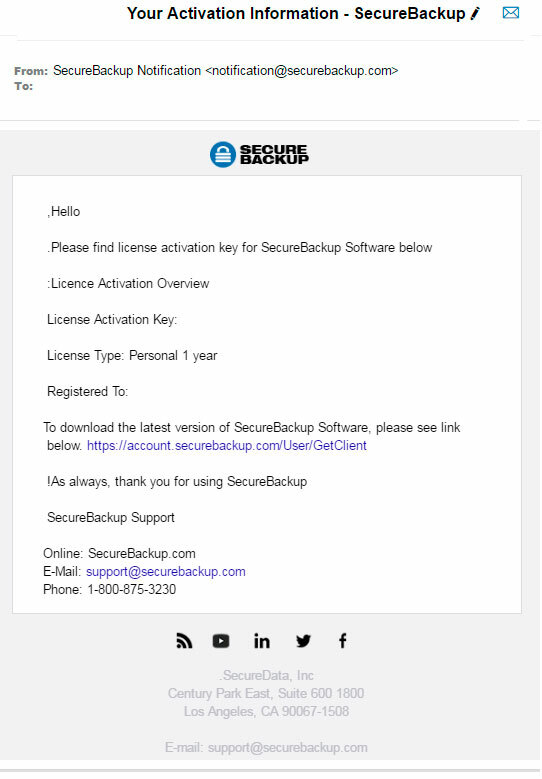 If you do not see the receipt in your inbox, please check your SPAM folder for a message with subject "your Activation Information – SecureBackup" from [email protected]. Please run the setup file. A setup wizard opens to walk you through the process from start to finish. The process is short and very intuitive. Once installation is complete, enter the requested information (your email and password you provided during the registration) to login. After a login you will be prompted to enter the license code. 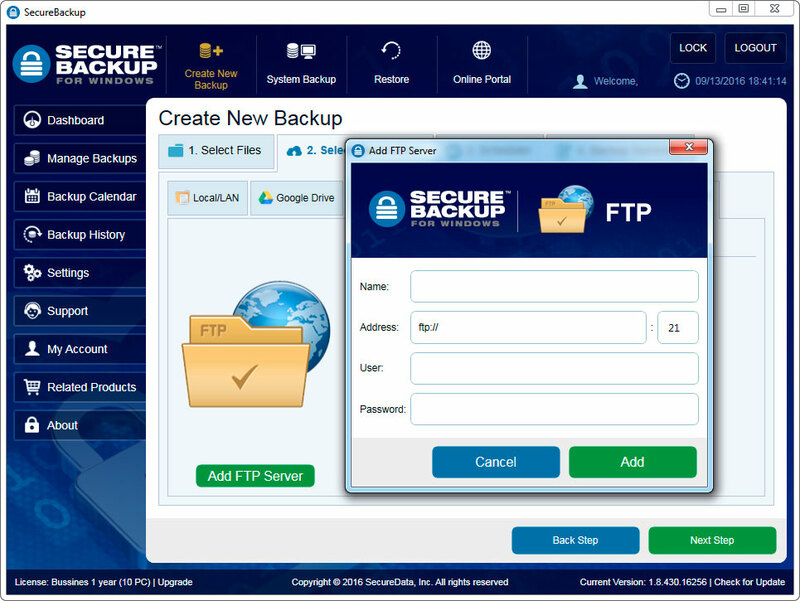 Secure Backup software is designed to backup personal files from your personal computer. Personal files are the files you create and most commonly interact with directly. 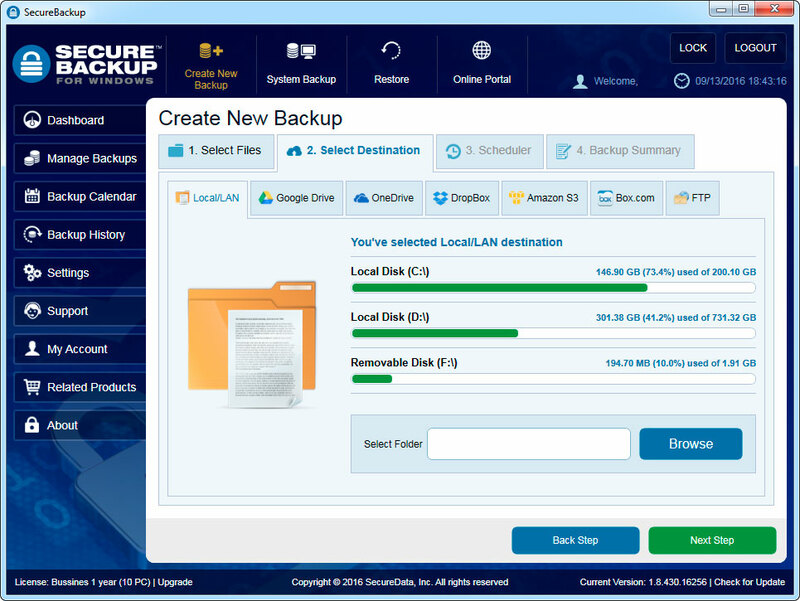 Select the source - SecureBackup allows you to pick the data locally, from external hard drive or from any place in your LAN. The additional option is a direct connection to MSSQL server for a database selection to backup. Auto scanning of your file system for pictures, videos, documents, music and pst/ost (Microsoft Outlook data files). Adding files manually - a single file, list of files, a single folder, list of folders, or adding files by extension. 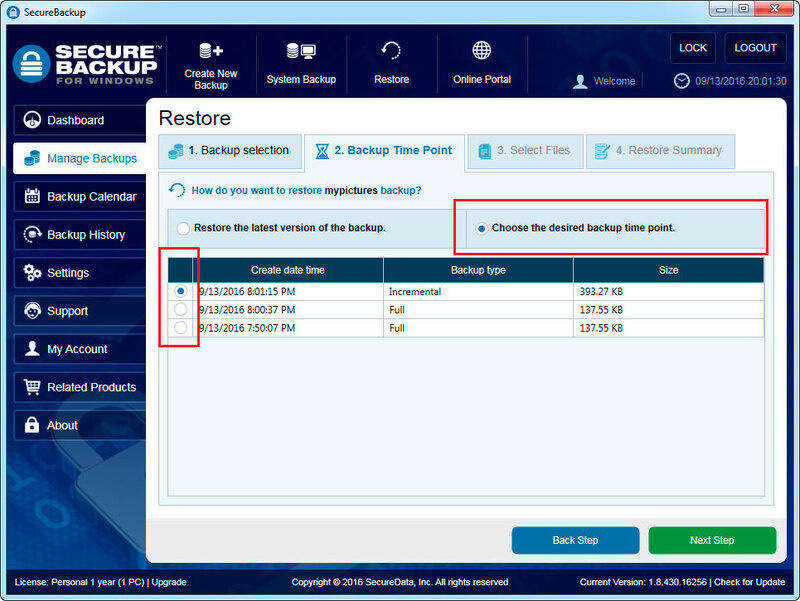 Incremental backup (recommended) - copies the data that has changed since the last backup. The benefit of an incremental backup is that it copies a smaller amount of data than a full backup. Thus, these operations will complete faster, and require less media to store the backup. Differential backup - copies the data that has changed since the last full backup. Differential backup requires more space and time to complete than incremental backup, although less than full backup. Preferences - determines, while backup job running, the number of versions of files to keep; when to remove old files; the minimum file size to backup; the maximal backup size on the destination. Filters - Excluding or including files using file type filtering - certain file types can be excluded or included from a backup without having to modify the file selection by unchecking each individual file. You can use ready patterns or create your own filter. 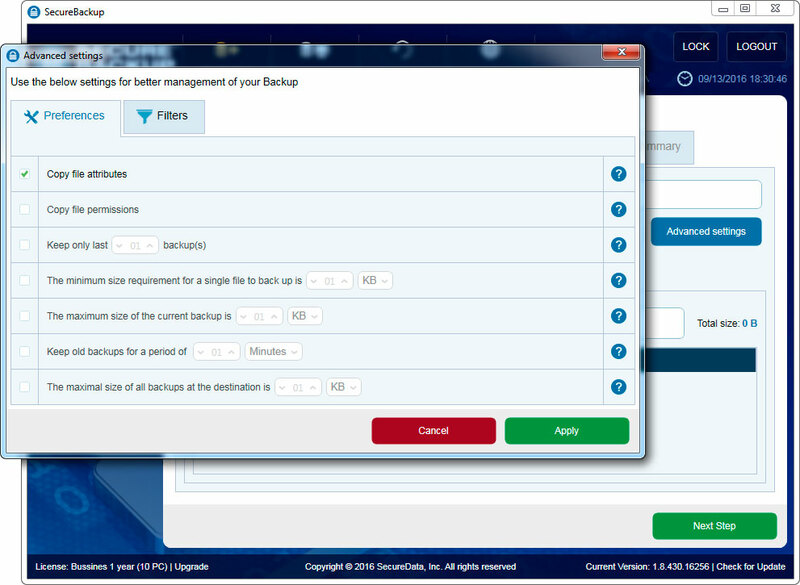 These settings apply to a specific backup job only. Backing up over a local network or to an external drive takes less time than sending your files over the Internet. 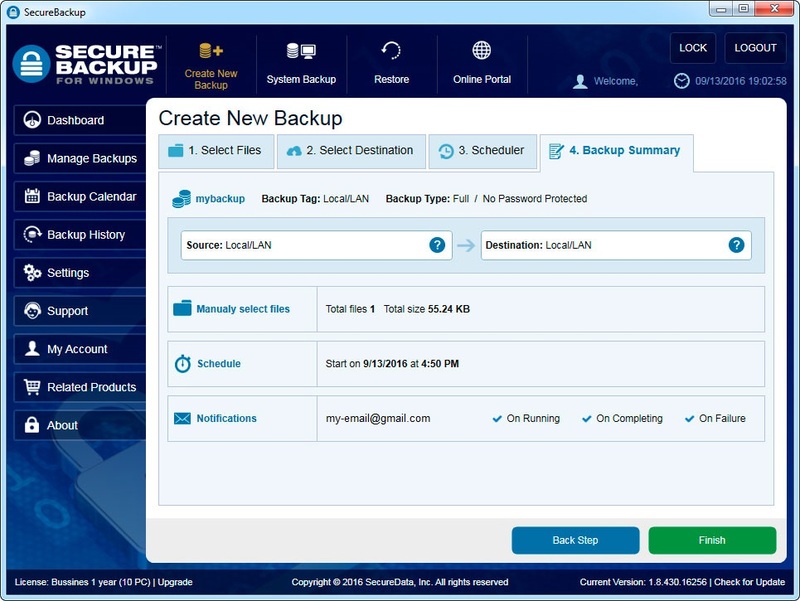 Restoring files from an onsite backup destination is much faster than restoring from a remote destination. However, because problems like theft, fire, power outages, typically affect all the computers in a single location, backing up to remote destinations reduces your risk of data loss and ensures you'll always be able to access your files when you need them. Adding Cloud/FTP destination - You can add cloud/FTP account in two ways: while creating a new backup job (Step # 2 - Destination selection) or in advance, through "Settings" menu. It's possible to add up ten accounts per cloud/FTP destination. Since the size of the storage space on the cloud depends on your account and usually it limited, need to take into the consideration the space quota for large backups. Go to "Advanced Settings" → "Preferences", to change retention policy to avoid reaching of the storage quota on the destination. How often to back up - You can completely control your backup schedule. 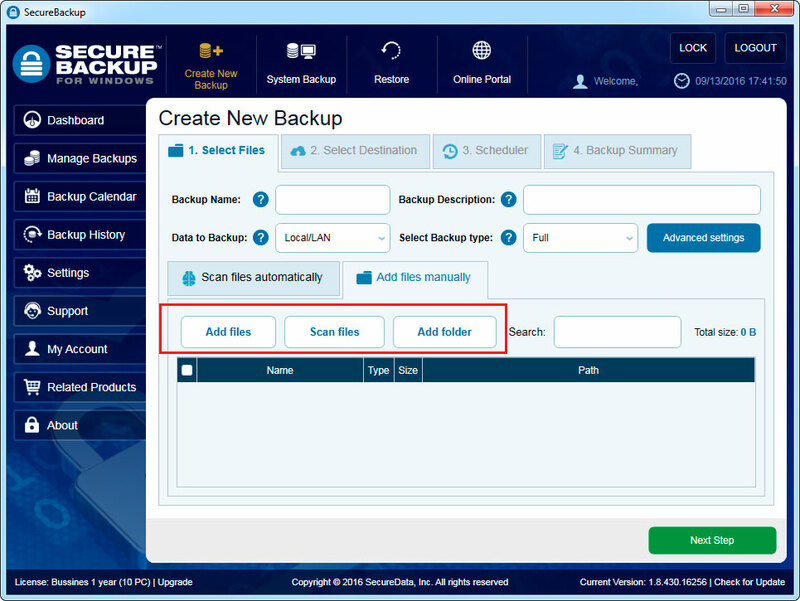 SecureBackup will run according to your schedule if the device is on and not in sleep mode, user is signed into the device, and user is signed into the SecureBackup application. 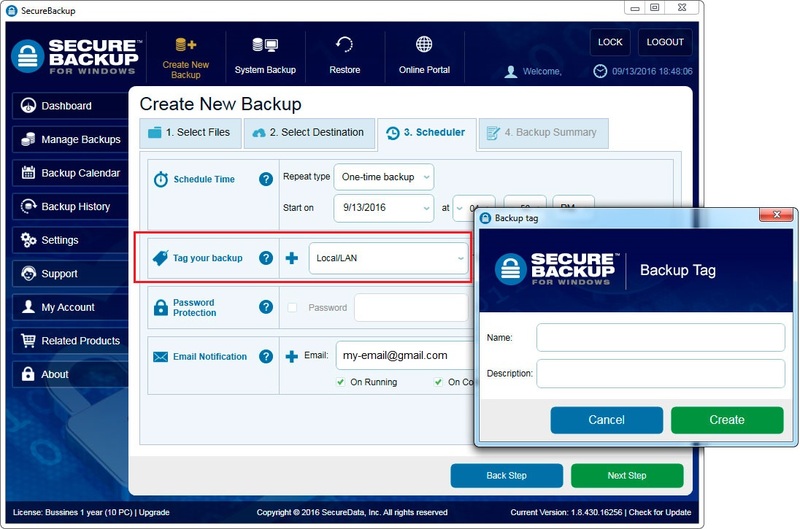 While setting backup schedule, you can select schedule mode, when to start to run a backup job and when to end this backup job. Schedule menu includes six options to choose: On-Time backup, Minutes, Daily, Weekly, Monthly and backup on PC shutdown event. 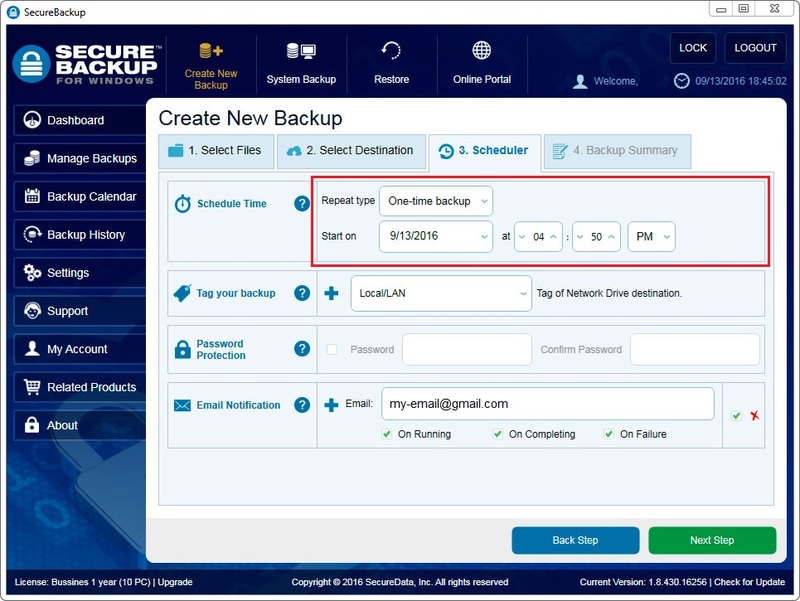 One-time backup Mode - This schedule will launch a single backup job session, one time only, on a specified date - you can pick from a pull-down menu containing a calendar. Minutes Mode - In this mode you can set your backup will be repeated by the minute. Weekly Mode - This schedule mode lets you select which days of the week to run a backup job and the intervals. For example you can select to do a backup every week on Monday, Thursday, or every second week, only on Saturday. Monthly Mode - On this schedule you can select the first, second, third, fourth or fifth of any day of the month. Also, you can choose several days in the month. Here are some examples: You can pick the first and third days of each second month. You can select the first and last days of each month. On PC shutdown event - Usually, system failures resulting in data loss occur when shutting down the computer. The best solution to this could be backup data at once after finishing work on the computer before it is shutdown. Tag your backup job: Adding tags to backup jobs will make easy you search or filtering while using "Backup Manage" or "History" wizards. Password Protection: - Password is used to protect your backup files from unauthorized access. By default "Password Protection" option is unselected. This will provide AES-256 encryption of the standard in ZIP protection. When choosing a password, it is recommended that you use a combination of letters and numbers and at least a 6 character long password. How to remove the password? 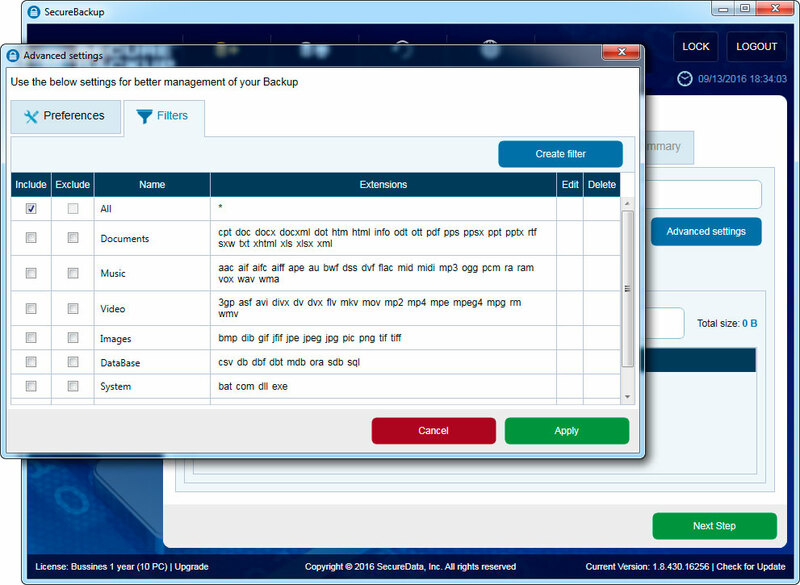 Press "Edit" backup job, through "Manage Backups" wizard and unselect "Password Protection" option. From this moment, your backup will be accessed without password. Antivirus and security software's is designed to protect your system against unknown applications and unauthorized Internet activity. 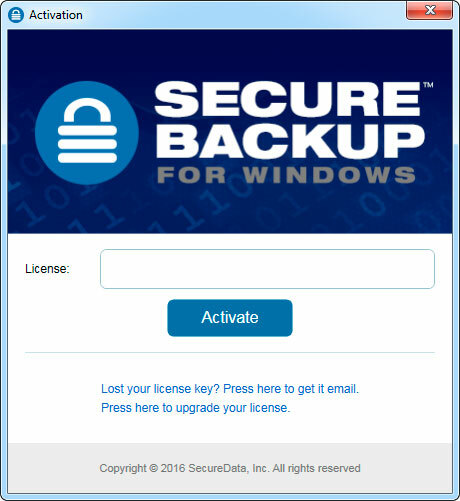 If your antivirus or security software doesn't recognize SecureBackup as an approved application, you may not be able to back up. We recommended to add an exception for SecureBackup to antivirus and security applications installed on your computer. Consult the Antivirus manufacturer's documentation on how to add an exception for a blocked application, then add an exception for SecureBackup that allows for incoming and outgoing communication. Go to "Setting" menu. 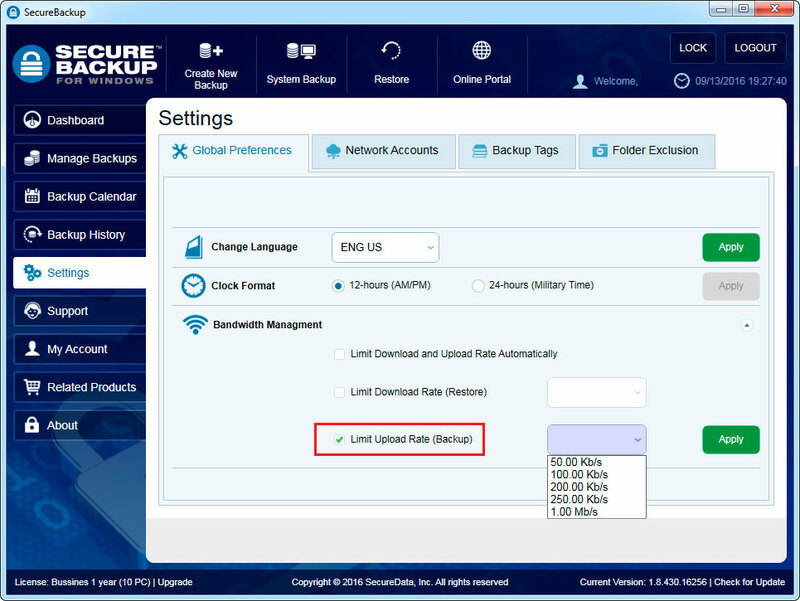 If SecureBackup is using too much bandwidth, try decreasing it by limiting of download rate in case of restoring data or by limiting of upload rate in case of backing up data. 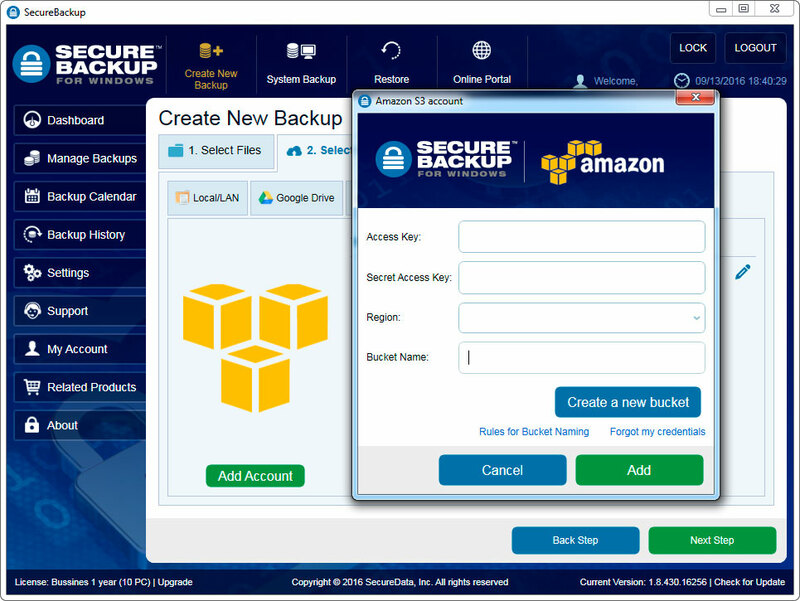 SecureBackup software is intended to back up your user files (pictures, music, documents, etc. ), not your operating system or applications. 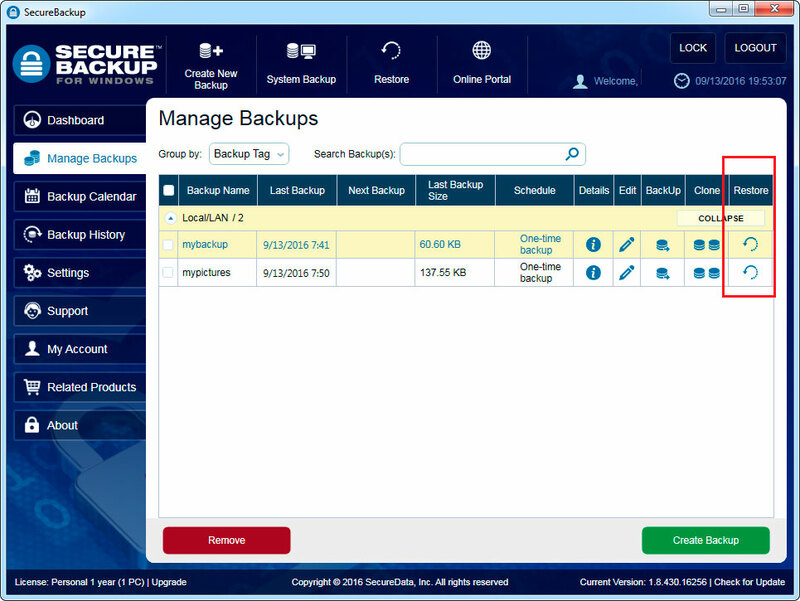 For this reason, SecureBackup excludes certain temporary files, system files and recycle bin folder. Under "Settings" menu you can add manually any folder or drive to exclude to backup. These settings apply to all backup jobs. On the backup running, On the backup completion and On the backup failure. By default all of these options are selected. A notification will be sent to the default email address. 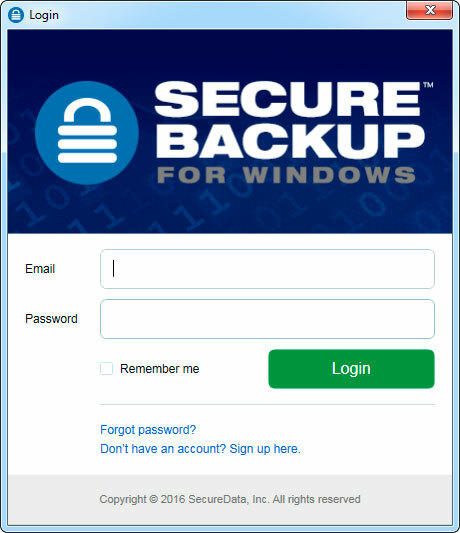 It"s possible to add up to ten additional email addresses to get backup status notifications. You can configure email notification options during creating backup job in the step #3 of "Create New Backup" wizard and your choice is valid only for the specific backup job. The email notification option can be canceled by your choice. 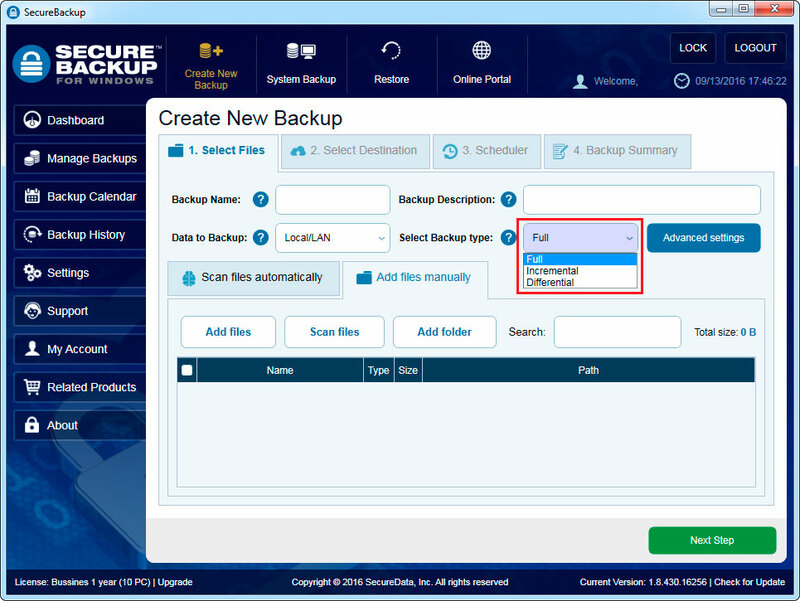 Additionally, SecureBackup automatically notifies the user when a backup job is starting to run, completed successfully and in case of failure. The appropriate pop-up will be appear in System Tray menu. 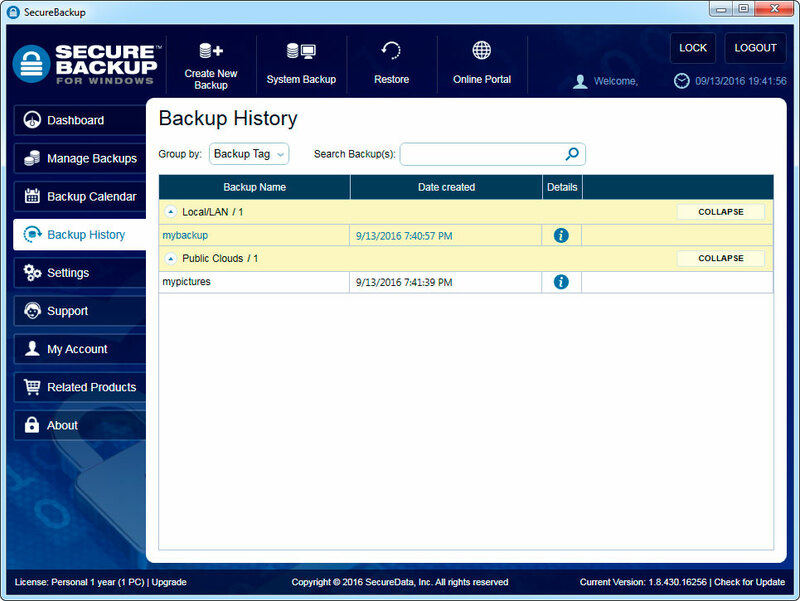 You can see the full history of each backup job or restore in "History" tab. Even if backup was removed, the history of this backup job will saved. 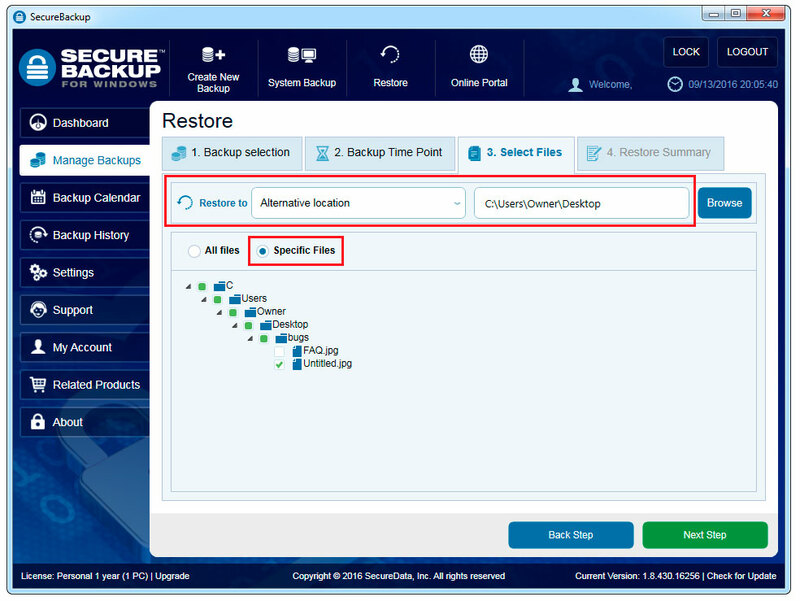 Select the backup - If you restore the data through "Restore" wizard, need to select which backup to restore from the backups list. 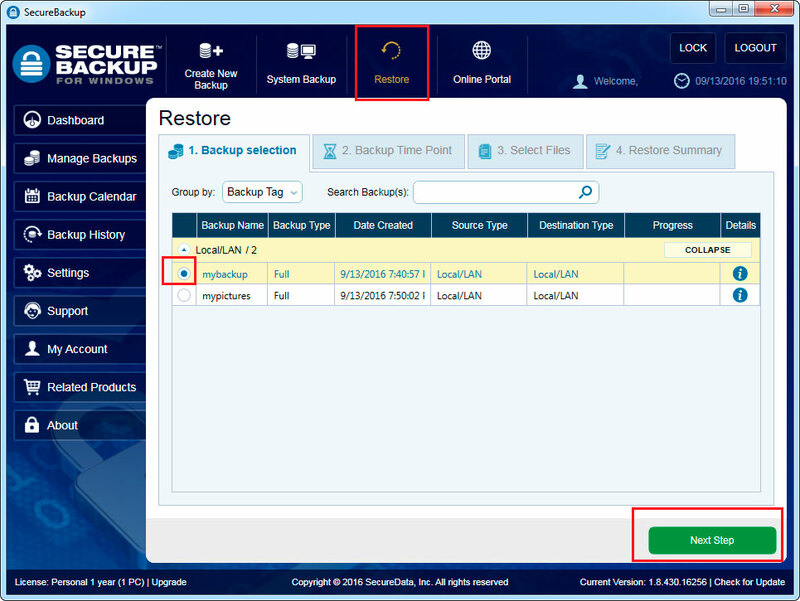 If you are in "Manage Backups" wizard, press on "Restore" button near to the appropriate backup. How to restore - If a backup job ran more than one time - incrementally, differentially, full scheduled or just was performed several times manually - you have a choice, as to which day you would like to recover the data. 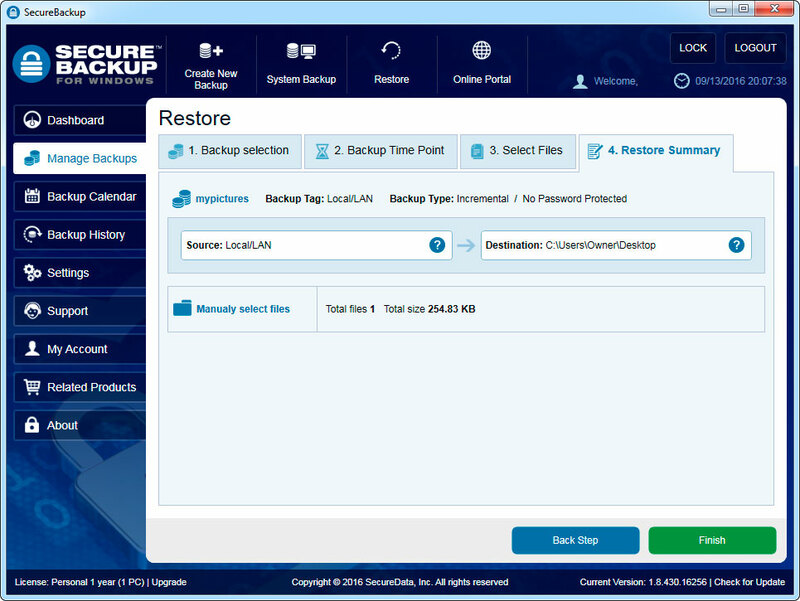 In most cases you would like to recover the most recent backup you have. 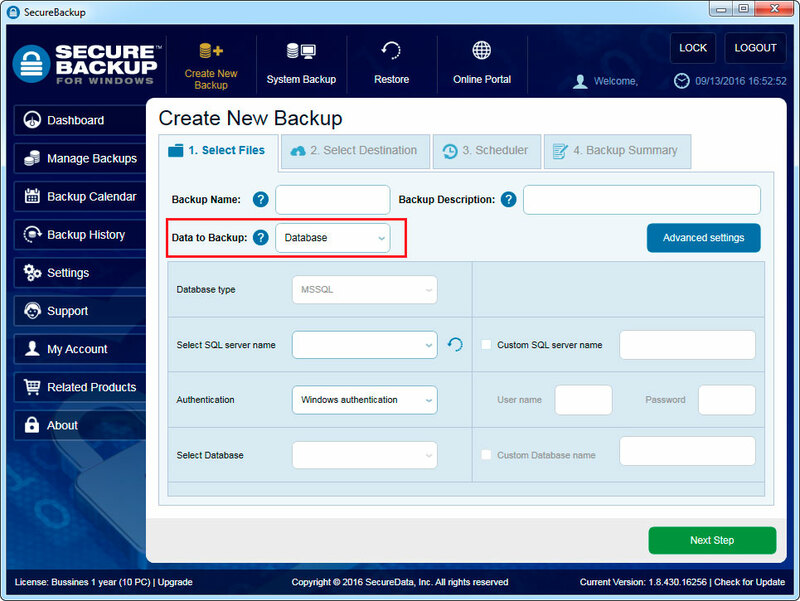 The additional option is selection of the specific date, then SecureBackup will restore the backed up data at this date. Restore Summary - This wizard provide you summary of the restore, including: Backup job name, Backup type, Source, Destination, Total size. 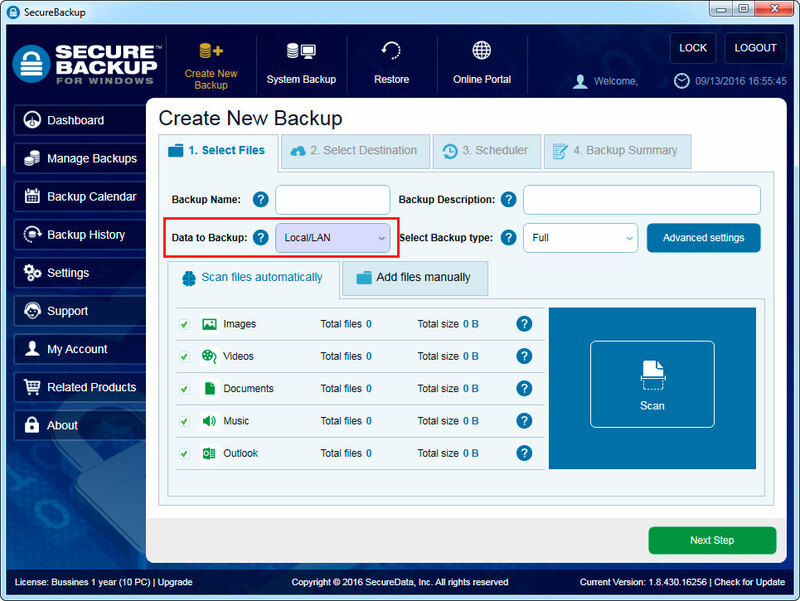 If backed up data was password protected, then in case of restoring through the software don’t need to enter the password - the software will perform this automatically. In case of restoring the data through the web portal, you will requested to enter the password during the access to the restored data. In case of the restoring your data through Secure Backup web portal, it is not necessary to wait until the restored data will be downloaded to your PC. Once the data will be ready, you will be notified by email and also you will be get a notification in the web portal.